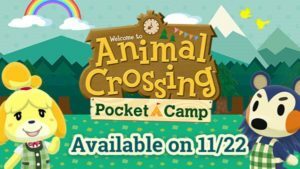 On October 25th We Reported That Animal Crossing Pocket Camp Will Available In Late November In Some Countries*. Today, The Official Twitter Handle Announced That Animal Crossing Pocket Camp Will Available On 22nd November Worldwide For Mobile Devices. In This Nintendo’s Game, You Play As Campsite Manager And Build Your Dream Campsite For Your Friends. You Grow Your Friendship With Animals And Earn Rewards By Helping Them – Find The Things They Need. You Customize Your Camp Site And Craft Materials[Furniture, Items] To Decorate For Your Animal Friends. There Are 17 Characters Featured In This Game. This Game Is Currently In Soft Launch[Only In Australia]. You Will Soon Enjoy This Game On Your Android/iPhone Device. Release Date – 22nd November. Launching – Worldwide. Platform – Mobile Devices. [ Check Out – Top New Android Games Here].